A joint venture of the Tourism Corporation of Gujarat and the Indian Railways, the Royal Orient promises you seven memorable days and nights. Your experience on the Royal Orient will be unique and unforgettable; in a luxurious setting with personalized service from liveried attendants. There are thirteen coaches and saloons, inspired from the mighty kingdoms. 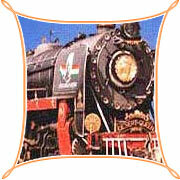 The train is fitted with all the modern conveniences you would expect in a first class hotel. Air-conditioned ambience keeps the temperature down to 15 degrees. Every cabin is clean, comfortable and furnished tastefully. The cabins have spacious baths attached to them, equipped with running hot and cold water. There are multi-cuisine restaurants to tickle your taste buds, as well as a bar- The Watering Hole with all your favourite drinks. There's even a library on the Royal Orient if you are looking for a quiet laid back time. All in all, a magical journey that you will cherish for a lifetime. Multicuisine restaurant with the "Watering Hole" Bar, with all your favourite drinks and some new ones too!, running hot and cold water, spacious baths, clean and comfortable cabins, furnished better than may 5-star hotels, a Library if you're looking for a truly quite, laid-back time.